Full disclosure: I own TSLA stock. I bought it quite a while after starting to cover the industry and plan to keep it for the long haul. I’m not looking to game the system, nor do I believe that my financial interests add any bias beyond just my passion for Tesla and the work they are doing to break the world of its addiction to oil in transportation and the combined beast that is energy storage/production. Having said that, let’s jump in! 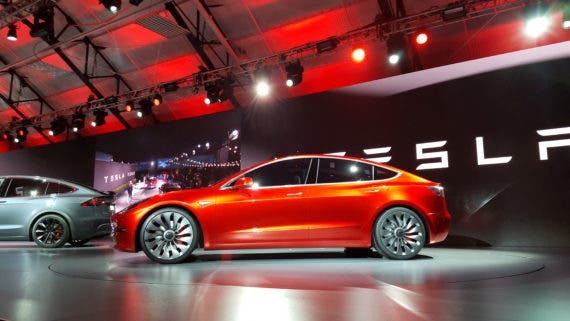 With the Model 3 holding down center stage when it comes to Tesla stock forecasts, analysts around the world are putting it under the scope, building cost estimates, and searching for profit (or loss), with batteries getting the majority of the attention, as they represent the single largest chunk of cash going into the vehicle. Analysts at UBS recently talked with Jon Bereisa (hat tip to StreetInsider), President and CEO of Auto Lectrification, who earned his stripes in the electrification of cars over at GM, having served as the chief engineer on the Chevy Volt program. UBS and AL chatted about the profitability of the Model 3, with UBS coming to the surprising conclusion that the Model 3 would need to be priced at $50,000 to be profitable … leaving a gap of $15,000 vs the current price. It’s difficult to put any weight behind these comments from UBS, as they have consistently been critical of Tesla’s stock price with regular calls to sell … in February, setting a price target of $140 to $160 with calls to sell. Seeing as how stock is around $250 today, it seems that the broader market is bullish on news of Model 3, in stark contrast to the UBS position. Interestingly, even with extensive experience at GM, which recently locked in battery cell pricing with LG Chem at $145/kWh, Mr. Bereisa’s forecast for best-case battery pack costs for the Model 3 comes in around $133–155/kWh by 2025. Given that Tesla is building batteries in-house in partnership with Panasonic at a much larger scale than anyone else, whereas GM is buying packs from LG Chem, it sure seems like Tesla would have a leg up on the competition … let’s dig into the details. That comparison bridges a wide gap, so let’s build out some structure to pull those two data points closer. First off — moving from battery cells (like the AA or D cell batteries in stores) to packs requires additional assembly and hardware costs. The cells must be arranged in order and wired up into groups with management and monitoring hardware to keep them all in line. This step in the process adds 20–30% to the cell cost. This overhead brings GMs price from LG of $145/kWh for cells up to ~$188/kWh today for an LG-supplied GM pack on the high side … today. Mr. Bereisa shared his estimate of Tesla’s pack costs at $260/kWh, with GM coming in at $215/kWh based on the pricing estimates and glide path shared back in October. GM has shared its pricing in what seemed to be a push to be taken seriously as a legitimate high-volume player in the EV market. Without the same detail from Tesla, it is difficult to compare and Mr. Bereisa made some assumptions in order to estimate Tesla’s pack pricing … which is where things got interesting. Adding yet another chapter to the direct PR model that Tesla seems to love, Jeff Evanson, VP of Tesla Investor Relations, actually dialed into the call during the Q&A segment to add some hard facts to the estimations Mr. Bereisa had made. Specifically, he mentioned that the Model 3 would only be partially aluminum, not all aluminum as Mr. Bereisa had assumed in his financials. This was known from day 1 with subsequent details coming out that it would not be all steel but that it would be a hybrid (gasp!) of aluminum and steel (oh, ok). Most importantly, Mr. Evanson also shared that Tesla’s all-in pack cost is already below $190/kWh, blowing away the estimates of $260/kWh. This sheds light on just how little data the analysts have to work with when compiling these estimates, and makes one question motives. What is to gain by putting out an extremely negative position on TSLA stock … especially if it’s wrong? This type of estimation makes UBS look amateurish and out of touch with current technology trends. Finally, Mr. Evanson added that the battery pack size for Model 3 would be smaller than the 60 kWh that was used in the financial estimates. This is an interesting note and indicates that the Model 3 will have an efficiency greater than the 3.3 miles per kWh of the Model S, with at least 3.58 miles / kWh minimum (215 miles / 60 kWh). Tesla’s entire strategy for the Gigafactory has been to flatten the entire supply chain by sourcing lithium and other raw materials locally to minimize non-value-add transportation and warehousing costs, which typically add significant overhead to battery production costs. Beyond that, the world has never seen the type of partnership Tesla has with Panasonic, with both investing on the scale of several billion dollars each into the shared factory, which necessarily drives a change to supplier margins, essentially requiring old methods for estimating battery costs be thrown out the window. EVs are driving scale and integration in battery production and supply like the world has never seen … which this virtual collision of worlds demonstrates all too well. In summary, this call was great for exposing actual pack pricing for Tesla and a few other exciting details leading up to the release of the Model 3, while at the same time showing how out of touch conventional auto and tech analysts are when it comes to this new hybrid industry that electric vehicles fall into.